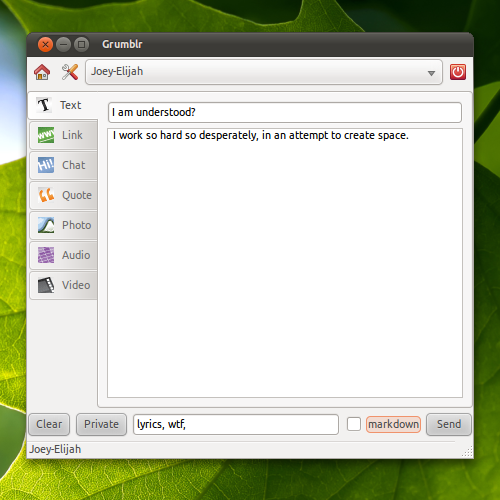 Grumblr - Nifty Linux Desktop app for tumblr - OMG! Ubuntu! Users of the increasingly popular Tumblr blogging service wishing to oil their creative juices should check out�Grumblr�- a desktop-based application for posting and updating Tumblr blogs. With the service being a sort of mash up of Twitter,�Facebook and MySpace, it’s not surprising that Tumblr is fast picking up new users. Social-style features allow readers to reblog other peoples’ entries, follow blogs they like and ‘fave’ specific posts all of which adds a friendly and gregarious community spirit. to the service. So to the Tumblr companion called Grumblr which, by side-stepping the need to edit in-browser where your attention is prey to all-manner of attention-ambushes, makes maintaining your Tumblr blog easier to do. The interface is like Tumblr itself: focused on helping you express yourself quickly. As such there are no advanced hidden features or superfluous extras tacked on – just what you need where you need it. Grumblr supports all of the Tumblr post types – with each corresponding entry page being tailored specifically – as well as support for post tagging, posting and marking private. Handy buttons to your own Tumblr homepage as well as the Tumblr dashboard are present on top and – �the clincher – it happily supports multiple-accounts with a drop-down menu for account-switching. Grumblr is a GTK_friendly application and can run under most desktop environments (including LXDE). Installation of Grumblr is slightly unorthodox compared to that of most applications we feature on OMG! Ubuntu!. As Grumblr is a Ruby gem (a ‘gem’ is format for distributing Ruby programs and libraries) there is no direct app download required. Instead we can install the gem using the Terminal (Applications > Accessories > Terminal) and punching in a few commands. The steps below should make it a breeze. Grumblr can now be launched from the Applications > Internet sub-menu.